LiveJournal Release 91 is live! Let’s just dive right in, shall we? Any of the thousands of mods on LiveJournal communities can attest to the hassle of editing tags after they’ve approved a post. Release 91 fixes this: Moderators can now edit tags before approving a post – especially useful if your community has pre-set tags. To keep track of who approves posts to the community you own or maintain – especially large ones with more than a few moderators – the username of who approved the post now appears above the entry subject line (visible to community owners & maintainers only). Note this feature is only available if the LiveJournal default comment pages are being used. For those of you who use lj-cut or visit communities and journals that do, you’ll notice a new icon depicting a pair of scissors – ✂ – to denote where the cut is. Selecting a userpic with multiple keywords will no longer cause the comment to post with your default userpic. Userpics can now be selected without the use of a mouse. Press Shift+tab until the userpic selector is highlighted, press enter, use the arrow keys to select the desired userpic, and press enter. You can also now use the arrow keys to select your desired userpic after clicking on the userpic selector to open it. Expanding very long comment threads in the site default commenting scheme will now properly expand the thread. Expand links will now appear even if every comment in a thread is frozen. Bold, italic, and underline buttons should now insert these tags in the correct places. "Your message was blank" errors no longer appear when hitting ctrl+enter twice. The Rich Text Editor will again show where you have inserted lj-cut and lj-spoiler tags. Settings for displaying CAPTCHAs in communities use the community's setting instead of the entry-author's setting. General display problems with image placeholders have been fixed. Formatting errors on the Sitemap have been fixed. "Share this" links have been fixed in styles where it was not functioning. Journal titles should appear again for Internet Explorer 8 users in the system styles that weren't displaying them. LiveJournal is saying goodbye to the beta games implementation. You’ll notice “Games” has disappeared from the LiveJournal navigation bar, and all of the games have been removed from the site. For those missing Writer's Block, please know that though it was removed from the LiveJournal home page, the writersblock community remains alive and kicking. Add it to your friends list to see the day's question right on your Friends page. 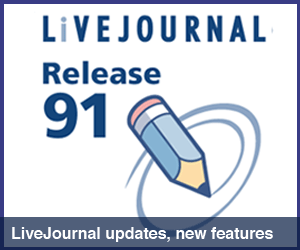 We hope you find the updates, changes, and fixes in LiveJournal Release 91 useful.